During his "dumbest thing of the week" segment (OH, the irony!) O'Reilly reported that Sebelius had spoken at Georgetown. He showed video of the part of her speech in which she was heckled by some anti-choice crazies whose views about "child killing" dovetail nicely with Bill's. He neglected to say that Sebelius received a rousing ovation after the ejection of the male disrupters (Don't ya love how Bill and his fellow manly zealots are so concerned about the lady parts!) Bill went on the attack: "Kathleen Sebelius is very "pro-abortion person even vetoing a bill that would have prevented late term abortions in Kansas. That's how extreme she is." He continued to kvetch about how she was invited to speak at a Catholic college and that's "inexplicable, inexplicable, dumb yes and a lot of other things." Bill O'Reilly so loves the ladies that he would force them to bear a severely medically compromised child just to see it have a short and painful life. His concern for children extends to allowing a nine year old girl, raped and impregnated by her father, to die as a result of giving birth to a child. Bill is neither a doctor nor does he play one on TV so maybe that's why he doesn't realize the late term abortion, under certain circumstances, is accepted by the AMA. Twenty nine states currently allow late term abortions to preserve the life and health of the mother and that was the statute under which Dr. Tiller LEGALLY operated. But who cares about life and health of the mother. 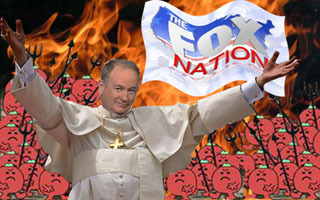 Certainly not O'Reilly whose misogny was underscored by his frequent commentary that Tiller performed late term abortions for silly women who were just having a bad hair day - or, as he put it - "for any reason.". What Bill didn't mention, in his anti-Sebelius screed, is that she vetoed the bill prohibiting late term abortions because she felt that it was unconstitutional and might intimidate doctors - something that Bill was trying to do to Tiller on an ongoing basis. Bill finds it "inexplicable" that Sebelius was invited to Georgetown. Perhaps he should read the statement from Georgetown's president, John DeGioia who noted that the Georgetown students were interested in Sebelius "as a distinguished public policy maker" and that her presence was not an endorsement of her views. DeGioia also noted Sebelius' "role in crafting the landmark legislation that will make health care more accessible to 34 million Americans who are currently uninsured" and added that this "was indicative of the immense contribution Sebelius would add to the event." Oh right, conservatives like Bill hate "Obamacare." One hopes that Bill's recent attacks on Sebelius do not inspire any violent actions because, as we know, Dr. Tiller was assassinated in a climate of hatred to which Bill, who fights "for the rights of the unborn" (women- meh?! ), greatly contributed and for which he was given a "Courage Award" from the hate group, Family Research Council. Glad her name doesn’t rhyme with anything inflammatory or God knows what he might call her.